The Maharaja of Tehri Garhwal is an important man. His kingdom is not necessarily one of great riches or political significance; but one more profound—a regency of stories, culture and myth. The Maharaja’s palace is spectacularly located at Narendra Nagar, about 18 km above Rishikesh, overlooking the Ganga and the lush spread of the Doon valley. 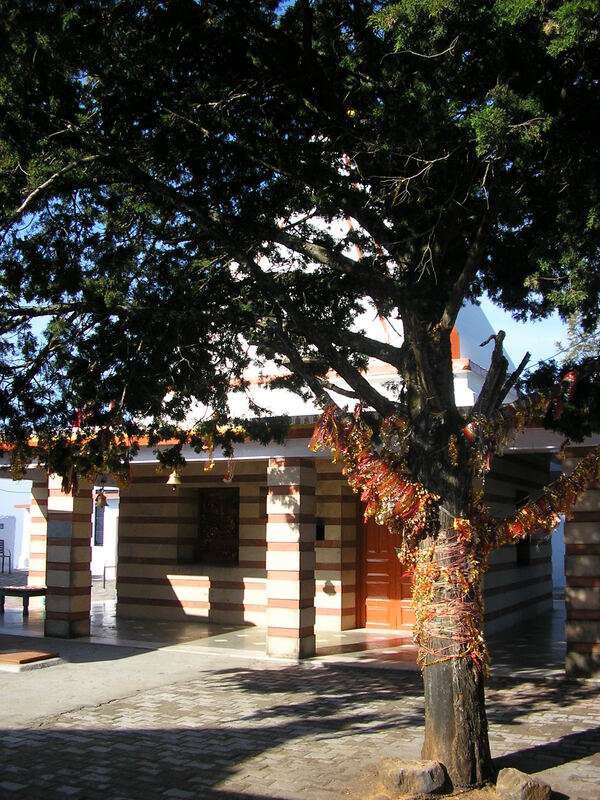 The Rawals, or hereditary priests of the Kedar-Badri shrines, high up in the Garhwal Himalayas, gather here every spring to decide the date on which the temples will be reopened after their winter hibernation, making this palace central to the mythos of the area. The building is itself of relatively new vintage, dating back to 1895, when Maharaja Narendra Shah shifted his capital from the high Himalayas to this outcrop overlooking Rishikesh and the Terai forests. The nearby village of Odathali was at this time rechristened Narendra Nagar. Once a favourite of the Viceroys, Indian royalty and other social elites, the palace and its surrounding grounds are today the property of the world-class luxury spa destination—Ananda in the Himalayas. The current Maharaja Manujendra Shah still owns the main palace precincts, with Ananda managing the palace annexe, including the magnificent Viceregal Suite and the sprawling green grounds. I arrived there late at night after a gruelling seven-hour drive from Delhi, feeling that I could use all the rejuvenation I could possibly get.The plan was to savour the delights of Ananda, as well as to explore the fascinating lower Himalayan foothills of Tehri Garhwal; often passed over by the average mountaingoer in favour of the more glamorous scenery of the Greater Himalayan Range further north. The location couldn’t have been better chosen. 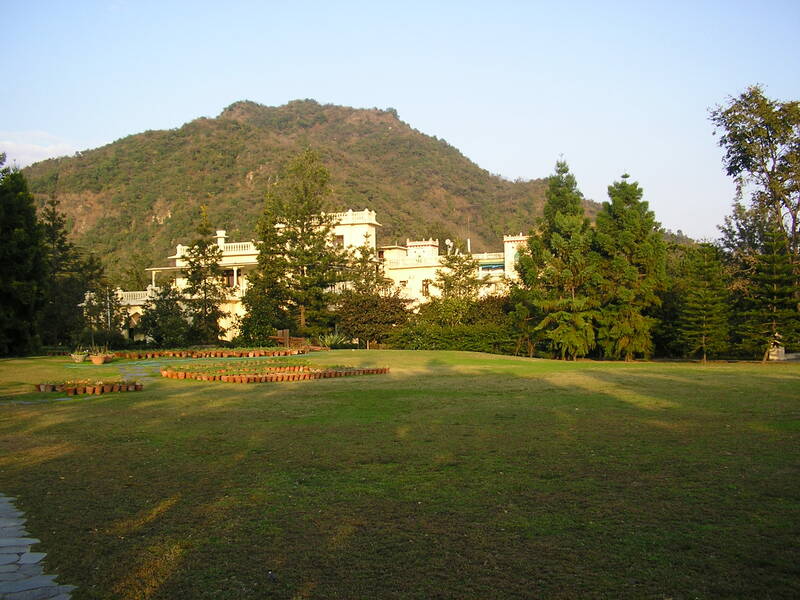 Ananda stands on a spur of the first wave of thickly forested ridges directly above Rishikesh. By virtue of its position, you get a panoramic view of not only the Ganga as it winds languorously towards the northern plains, but also of the hazy ridges stretching away to the west and east. A few thousand feet below lies the immense carpet-like spread of Rajaji National Park, itself a part of the northern Terai forests that stretch from the foothills of HimachalPradesh in the west, to the plains of Assam in the east. Far to the west, you can see Dehradun, jewel of the Doon valley, and even the lights of Mussoorie on a clear night. Of all the luxury hotels and resorts that I have visited, Ananda ranks among the best. The staff exudes a genuine warmth and consideration, and will go quite far out of their way to ensure that you have a comfortable stay. The spa has an extensive range of arrangements for different tastes, and I had no trouble at all getting help to do the things that I wanted to do. Ananda is designed to be a holistic retreat, and it fulfills these goals admirably with an excellent staff of masseurs, yoga and Ayurveda experts. What’s more, there’s delectable food to be had that can be made to suit you. Depending on the packages that one would like to avail, as well as any sightseeing one would like to do, the resort makes a detailed itinerary for its patrons. I set out one morning with my guide Dinesh, to hike to the local temple of Kunjapuri, an old Shakti Peeth (Centre of Power). According to legend, it is here that the breasts of Parvati landed when the god Vishnu cut down her corpse to stop Shiva’s cataclysmic dance of rage. The temple of Kunjapuri is located on a peak looming some 6,000 feet above the Ganges valley, a six to seven km walk from Narendra Nagar. Trekking up through the forests and occasional villages early in the morning is an invigorating experience. Although I have reasonably good mountain feet, I was soon cursing my general lack of fitness and my thoughts were straying to Ananda’s massage centre. But, as Dinesh said, mountains are the best elliptical cross trainers in the world, and soon I was breathing regularly and my thigh muscles gradually ceased screaming. Coming out of the green cover at the top is an exhilarating experience. Rounding the steepest bend of the ridge directly below the temple steps, you are greeted by a mountain panorama of the kind only Uttarakhand can provide. 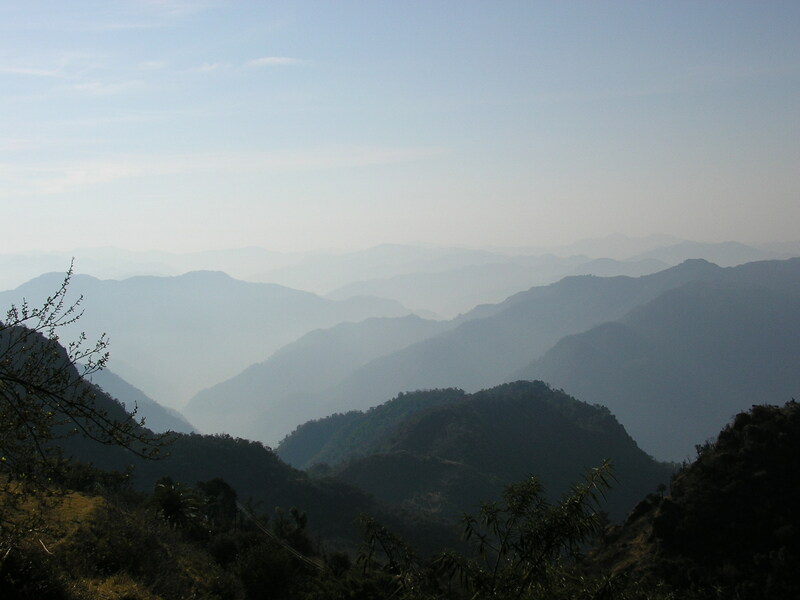 Behind and below lay the Doon valley, and the North Indian plains under a thick haze. To the west stretched out the unending roll of the lower Himalayas. I could see the gorge that the Ganges sculpts for itself on its way down from Devprayag, the confluence of the Bhagirathi and Alaknanda rivers. In front, going north, lay the waves of ridges that make up the middle Himalayas, rising in a steep gradient until finally the view was arrested by the glittering white wall of the Great Himalayan Range; massive jagged peaks and glacier systems stretching from the borders of Himachal Pradesh in the misty west to the Kumaon region of Uttarakhand in the east. I have passed through Rishikesh countless times in my travels into the mountains, but never had I imagined that such views existed a mere hour from the town! The temple is a pretty structure painted in warm white and orange. Though the outer structure was built in the early eighties, the inner sanctum and idol look immensely old. 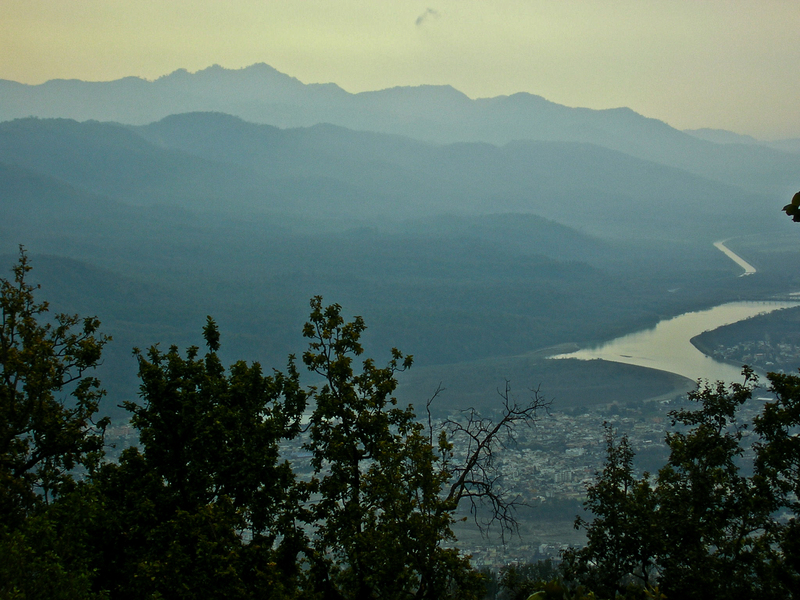 From the highest point to the low, I made my way down Rishikesh. Of great religious interest to the Hindus, as well as the main hub for trekking and rafting in the area, Rishikesh is a fascinating town. Dotted with ashrams belonging to various sects, the Ganges winds its way down from the gorge and flows out onto the plains here. An ancient centre for yoga and Ayurveda, as well as for foreign backpackers looking for a simplified Indian spiritual experience, Rishikesh is a complex melange of sights and sounds that threaten to overwhelm you with sheer detail, until you sit down by the Ganges, close your eyes, and realise that it’s all maya. Your post really brings home just how badly I miss the mountains. Such lovely pictures and words, B. Thanks Rimi. The wonders of Lightroom. I’m afraid the thighs get too much rest for my liking as it is! Nice panorama work, birdling. Give those thigh muscles a rest now.